• Depressed Center Wheel Grinder, for fast weld and stock removal, rust and scale removal, heavy deburring. • 4" Diameter, Right Angle, .4 hp, Rear Exhaust, 12,000 RPM. • Accepts optional 4" diameter Type 27 Reinforced Depressed Center Wheel, with 3/8" center hole (wheel width of 1/8" to 1/4"). • 12,000 RPM air motor has Kevlar phenolic vanes for longer life. Safety-lock throttle lever, wheel guard and flanges are included. 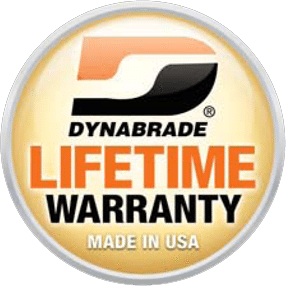 The Dynabrade 52706 4" (102 mm) Dia. Right Angle Depressed Center Wheel Grinder, Non-Vacuum is a Dynabrade tool within the Grinder category of tooling range. Depressed Center Wheels of 102mm can be used which can also be supplied by DynaShop. A Non-Vacuum tool with a maximum RPM of 12000, a power rating (hp/W) of 0.4 (298) with a weight of 0.77kg. Please complete the form below to arrange a tool demonstration for the Dynabrade 52706 4" (102 mm) Dia. Right Angle Depressed Center Wheel Grinder, Non-Vacuum or any of the Dynabrade range of tooling. Alternatively please call us on 01273 468736.